Three Trees Chapel offers a stunning location near the mountains with a cozy, romantic atmosphere and the most spectacular views in Denver. 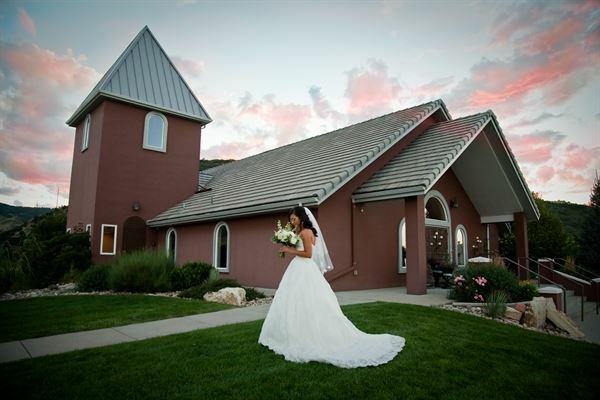 Our gorgeous hilltop venue in the scenic foothills of Colorado overlooks the valley of the Front Range. Three Trees Chapel offers the perfect intimate setting for your special event, accommodating groups of 2 to 200. The chapel's simple elegance is highlighted by warm colors and rich hardwood floors. Picture windows rimmed with fine, crafted woodwork frame an unforgettable view of the foothills. The chapel and reception room offer the ambiance and sophistication of a mountain resort. The Chapel offers you the flexibility to create your own wedding and reception package. Or, you can rely on the chapel's expert staff to design a personalized, all-inclusive event that will save you time and money and help eliminate the stress of planning your own occasion. Skip the courthouse and elope with your soulmate at our beautiful and very special chapel. Packages start at just $285! Wedding Ceremony and Elopement Packages starting at $285! Our wedding ceremony packages will make your special day stress free as we coordinate the entire rehearsal and ceremony for you. This two hour reservation package includes the music for guest seating and for the ceremony; silk flower décor on the pews and altar; candles and candelabras for the altar; wedding consultant and coordination staff. Our chapel wedding consultant will coordinate with all participants and vendors for both the wedding and rehearsal and will meet with the bride and /or others two to four weeks prior to the wedding to go through final details. Ceremony Pricing: Elopement Packages starting at $285 Weekday ceremonies Monday-Thursday (any 2 hour time block): $600.00 Friday, Saturday or Sunday Pricing starts from $750.00 Please visit our website for complete rental details. Picnic buffet package includes: The finest cuts of Turkey, Lean Ham and Rare Roast Beef with Swiss and Sharp Cheddar Cheeses Vegetarian sandwiches included Served with Dijonnaise on a selection of fresh baked assorted cocktail rolls and mini croissants (2 sandwiches per person) Includes your choice of two side salads This five hour package includes: • Chapel rental • Rental of the reception hall • Entrée • DJ - 4 hours with professional DJ (DJ is not included in packages less than 50 guests but may be added for an additional fee) • Package includes the wedding cake which you may choose and design through our bakery Package Cost: Up to 30 guests: $2785 (this is a 3 hour package; DJ may be added for an additional fee to this package) Up to 50 guests: $4565 Up to 60 guests: $4855 Up to 80 guests: $5345 Up to 100 guests: $5850 Please visit our website for complete rental details. Italian buffet package includes: Hors D’ oeuvres (choice of one) Entrees (choice of two) French Garden Salad Garlic Bread or Dinner Rolls This five hour package includes: • Chapel rental • Rental of the reception hall • Entrée • DJ - 4 hours with professional DJ (DJ is not included in packages less than 50 guests but may be added for an additional fee) • Package includes the wedding cake which you may choose and design through our bakery Package Cost: Up to 30 guests: $3100 (this is a 3 hour package; DJ may be added for an additional fee to this package) Up to 50 guests: $5495 Up to 60 guests: $5935 Up to 80 guests: $6370 Up to 100 guests: $7145 Call for packages over 100 guests. Please visit our website for complete rental details. Brunch buffet package includes: Fresh Scrambled Eggs, Sausage Patties, Crisp Smoked Bacon and Scratch Buttermilk Biscuits Served with Sauteed Peppers and Onions, Shredded Cheese, Butter and Salsa and Fresh Flour Tortillas Accompanied by Hash Browns and a Fresh Fruit Display. This five hour package includes: • Chapel rental • Rental of the reception hall • Entrée • DJ - 4 hours with professional DJ (DJ is not included in packages less than 50 guests but may be added for an additional fee) • Package includes the wedding cake which you may choose and design through our bakery Package Cost: Up to 30 guests: $3125 (this is a 3 hour package; DJ may be added for an additional fee to this package) Up to 50 guests: $5095 Up to 60 guests: $5535 Up to 80 guests: $5995 Up to 100 guests: $6695 Call for more information for guests exceeding 100 Please visit our website for complete rental details. Wedding buffet package includes: Hors D’ oeuvres (choice of one) Entrees (your choice of one) Tossed French Garden Salad with choice of dressing Garlic Bread or Dinner Rolls This five hour package includes: • Chapel rental • Rental of the reception hall • Entrée • DJ - 4 hours with professional DJ (DJ is not included in packages less than 50 guests but may be added for an additional fee) • Package includes the wedding cake which you may choose and design through our bakery Package Cost: Up to 30 guests: $3365 (this is a 3 hour package; DJ may be added for an additional fee to this package) Up to 50 guests: $5595 Up to 60 guests: $6035 Up to 80 guests: $6445 Up to 100 guests: $7245 Please call for guest count exceeding 100 people. Please visit our website for complete rental details. Beautiful setting near the mountains. Chapel holds up to 200 guests and is your private setting for your wedding and reception. You won't have public on-lookers or other weddings happening during your reservation at our venue! Atmosphere/Decor: Stunning views down Dakota Ridge Valley against the back drop of our waterfall just outside the altar window. Special Features: Hardwood floors and cathedral ceiling. Atmosphere/Decor: Wooden floors and ballroom lighting and up-lighting in your color scheme. Our indoor reception hall is 5 steps from our tented reception garden area. Special Features: Our venue is your private setting - you won't share your special day with any other events happening at the same time!